It’s definitely not feeling like Spring yet in the North East of Scotland, but that’s not really a huge surprise! 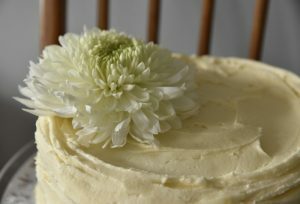 Although the paths are lined with daffodils and the blossoms are starting to bloom, the weather hasn’t quite got the memo yet but that just means there’s even more of an excuse to channel Spring through decorating and baking! 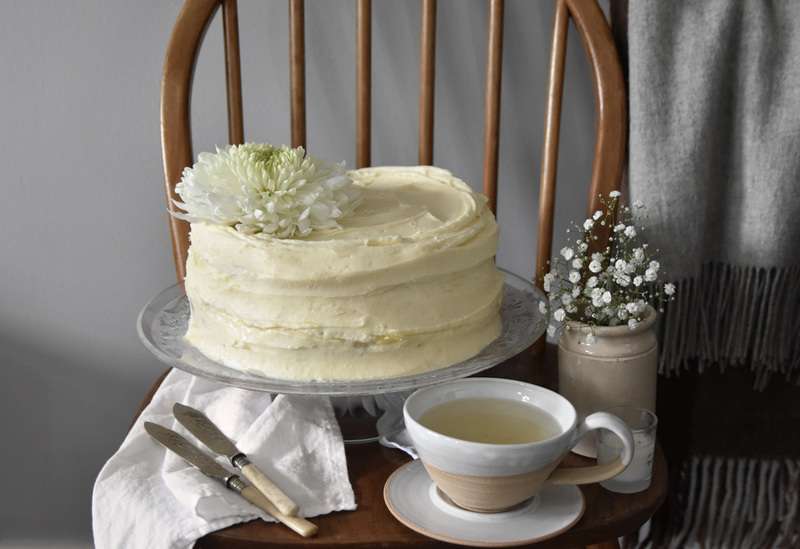 Spring is a time for lighter bakes and by using apple tea to flavour this cake you’re given just that making it the perfect cake for Easter weekend celebrations! Step 1. Preheat the oven to 180 degrees and line two 8 inch round cake tins with parchment paper. Boil the kettle and place the 6 apple tea bags in a small bowl, carefully adding 6 tablespoons of freshly boiled water into the bowl with the teabags for them to steep in then set aside for later. 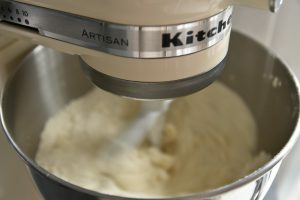 Sift the flour and baking power into a bowl with the sugar, salt and unsalted butter and mix together in a freestanding mixer or bowl and whisk, until the mixture resembles fine breadcrumbs. Step 2. Pour the milk into a jug along with the eggs. Once cooled squeeze all the juice you can get from the tea bags into the bowl they have been steeping in and add this into the jug along with the milk and eggs then whisk it all together with a fork. 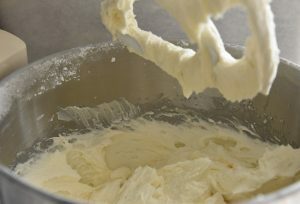 Pour the mixture into the dry ingredients whilst continuing to mix on a slow speed, then turn up to medium once added until the mixture is smooth and evenly mixed. Step 3. 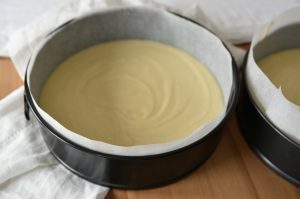 Carefully pour the mixture evenly between the two lined baking tins and place in the preheated oven for around 45 mins to 1 hour, checking when the cake looks golden on top. Remove once a skewer test comes out clean and the top of the cake is springy when gently touched. Step 4. 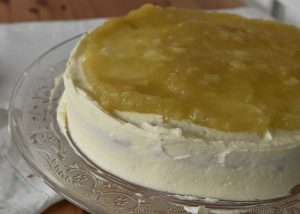 As your sponge is baking away in the oven you can make you apple filling. To do this peel and slice your apples then place them in a pan along with the caster sugar, a pinch of cinnamon and three tablespoons of water. 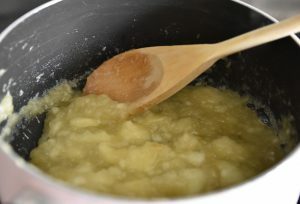 Turn the heat to medium and let the apples break down stirring occasionally until the mixture resembles a thick sauce then remove from the heat and set aside to cool. 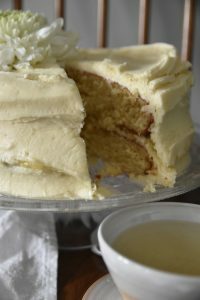 You can also now repeat the teabag step for your icing. Step 5. 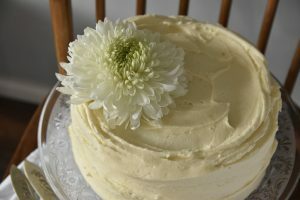 When the sponge is ready, remove it from the oven and set aside until it is completely cool before icing it. 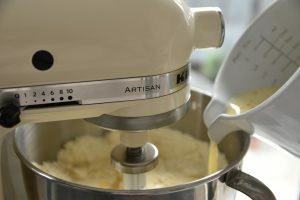 To make the icing in a freestanding electric mixer or bowl with whisk, sift in the icing sugar and add the softened butter then mix together until the mixture resembles fine breadcrumbs. Place the milk in a jug and add the juice squeezed from your teabags and slowly add this into the icing mixture whilst on a low speed. 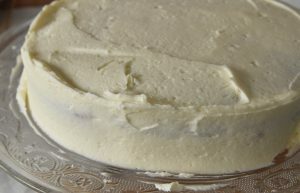 Once added, mix to high until you have a smooth and fluffy icing. Step 6. 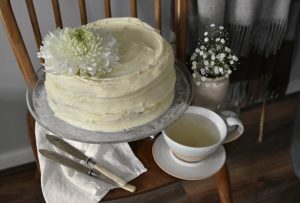 Trim the sponge as necessary until you have a nice even and flat sponge and place a little spoonful of icing in the middle of a board or cake stand. 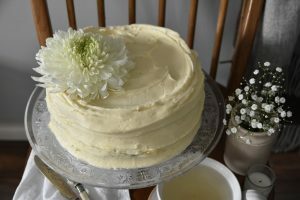 Place one layer on top of the cake stand or board and use a large palette knife to evenly spread a generous layer all over the sponge. Step 7. Once you’ve completely covered your bottom layer, add your apple filling on top spreading it on top as a thick layer to fill your cake with. Step 8. 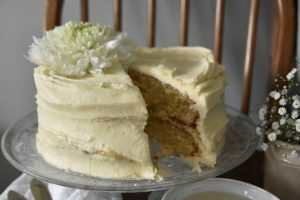 Place your second sponge on top and use the remaining icing to cover the cake using the palette knife to swirl the icing around on top. 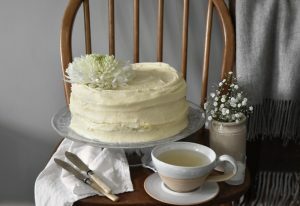 Finish by adding a real flower, brew a pot of apple tea to compliment and enjoy! 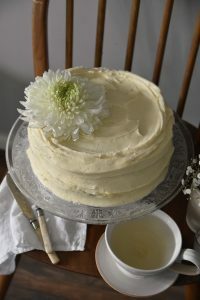 Have you got any Easter baking plans? For some more easter recipe ideas you could have a go at my Rocky Road or Lemon Cake!